In the past, fleur-de-lis symbol was used heavily by some European royals. These days, this chic decorative sign is used for several ornamental purposes. 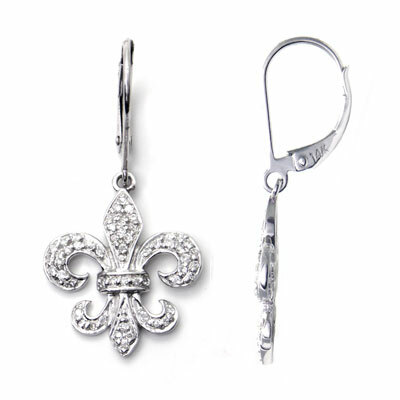 From that idea, these fleur-de-lis earrings were created. With the white gold, and especially diamonds on top, these are not just simply fleur-de-lis earrings, but the one piece of accessory which will create the luxurious royal look in you. I really love them and woul purchse from you again the earrings came on time and were as they were depicted! Please make larger earrings in the same quality!!!! !